Allah commands that He be remembered after the rituals are performed. (But of mankind there are some who say: “Our Lord! Give us (Your bounties) in this world!” and for such there will be no portion in the Hereafter.) qmeaning, they have no share in the Hereafter. This criticism serves to discourage other people from imitating those mentioned. The supplication mentioned and praised in the Ayah includes all good aspects of this life and seeks refuge from all types of evil. The good of this life concerns every material request of well-being, spacious dwelling, pleasing mates, sufficient provision, beneficial knowledge, good profession or deeds, comfortable means of transportation and good praise, all of which the scholars of Tafsir have mentioned regarding this subject. All of these are but a part of the good that is sought in this life. As for the good of the Hereafter, the best of this includes acquiring Paradise, which also means acquiring safety from the greatest horror at the gathering place. It also refers to being questioned lightly and the other favors in the Hereafter. 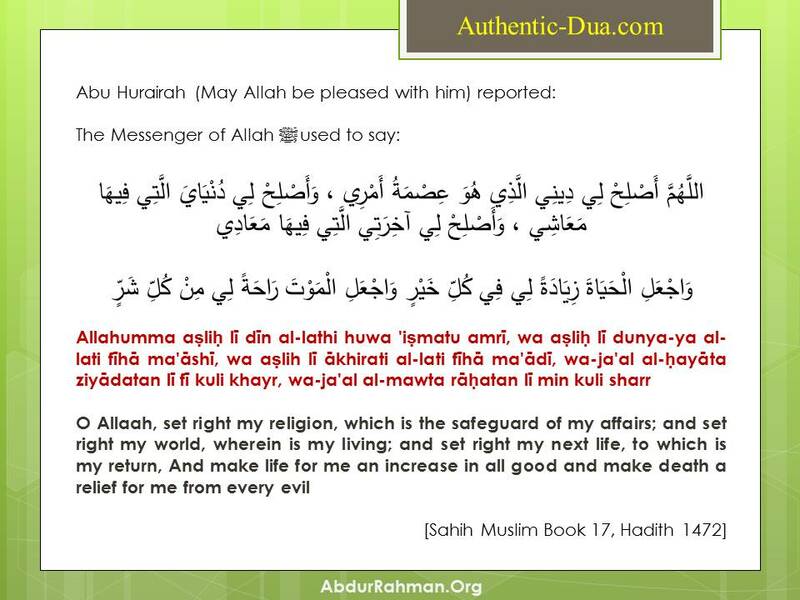 The man began reciting this Du`a and he was cured.” Muslim also recorded it.